Is osteoarthritis a single disease, or could it be a collection of etiological distinct subtypes? Researchers from The Netherlands are using MRI to investigate this question. A study they conducted of overweight patients with osteoarthritis and lean patients who had developed osteoarthritis from physical activity has yielded the interesting finding that shows that MRI features of the disease are different in these two groups. osteoarthritis associated with physical activity and mechanical joint overload. This is believed to be caused by repetitive joint-impact during strenuous activity, inducing mechanical stress on the joint surfaces and triggering the degeneration of joint tissues. However, it is not known whether these two potential subtypes differ in how the disease manifests with respect to symptoms and structural degradation, according to co-author J.H. Waarsing, Ph.D., of the Department of Orthopedics at Erasmus Medical Center in Rotterdam, and colleagues. The study, published online in Osteoarthritis and Cartilage, evaluated two groups of 50 subjects each enrolled in the Osteoarthritis Initiative, an international multi-center longitudinal prospective observational study of knee osteoarthritis. The metabolic syndrome group of patients was significantly overweight, and also had two additional criteria that included hypertension, insulin resistance or dyslipidemia. The physically active lean group exercised between three and seven days a week and had a body mass index (BMI) of less than 25 kg/m2. All participants had MRI scans at their 48-month follow-up date. Their features of knee osteoarthritis were assessed using the MR Imaging Osteoarthritis Knee Score (MOAKS). The researchers combined the 14 compartments of the MOAKS score into six anatomical plates, and the six meniscus compartments were grouped into medial and lateral compartments. The authors reported that in the metabolic syndrome group, scores for cartilage damage were significantly higher in the patella, trochlea, and lateral femur. 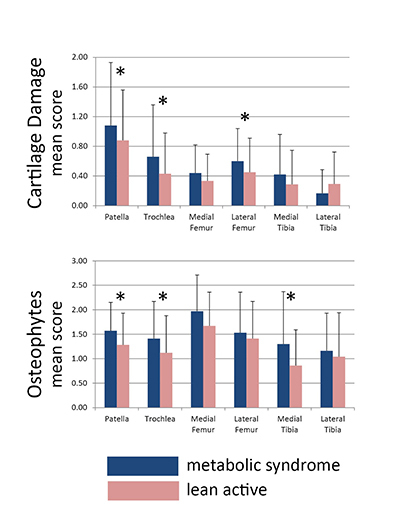 Osteophyte scores were higher for all compartments, and prepatella bursal signal, representing bursitis, was more prevalent. Among physically active lean patients, Hoffa synovitis was significantly more prevalent. Meniscal tears were most prevalent in this group, although the authors reported that meniscal degeneration was seen in 80% to 90% of the knees in both groups. Roze RH, Bierma-Zeinstra SMA, Agricola R, et al. Differences in MRI features between two different osteoarthritis subpopulations: data from the Osteoarthritis Initiative. Osteoarthritis and Cartilage. Published online December 18, 2015. Osteoarthritis: Difference in MRI features between the overweight and the lean patient. Appl Radiol.